Are you planning a retreat somewhere beautiful? Vortices Design has the perfect solution for you. Our custom built retreat sites will help you vusually convey the feel and message of your treat affordably. We take the vision you hold for your retreat and express it visually using our custom parallax style template, which is a vertically scrolling web site. Just provide us with images and a logo (or we can create them for you) and your content your site will be ready sooner than you think might be possible. We've spent many hours developing a powerful custom retreat template that allows us to quickly put together your site at a very affordable cost. Our template is built modularily so you can pick any element from it and we can expand it into a full web site. 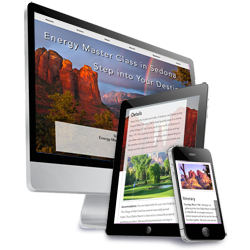 Call us today at 503 521-6895 or toll free at 800 952-4182 for an free initial consultation and learn how affordable your new custom retreat web site can be. Every site we produce is always mobile friendly and fully compliant with current W3C web standards. If you would like to request additional information about our services please Request a Bid.